Just in Time For The Daf Hayomi Start of Bava Kamma! ArtScroll has just released 3 New Volumes of the Schottenstein Hebrew Digital Edition of the Talmud – in time for the start of Bava Kamma. TRY IT FREE! Download Samples of the Schottenstein Digital Edition Tractate Bava Kamma for your Apple or Android devices in Either English or Hebrew editions. Click here for instructions on how to download 10 FREE BLATT. We love June! It means camps, colonies, and vacation trips finally on the horizon. It means barbeques and sunny days. And it means ArtScroll’s annual 20%-off-everything June sale! The Schottenstein Edition Talmud Bavli is one of the greatest achievements in the history of Jewish publishing. Now you can get individual volumes – and a dream come true, the full 73-volume set, in either full or daf yomi size — at 20% off list price. Enhance your learning and your library with The Schottenstein Edition Talmud Yerushalmi and ArtScroll’s Mishnah editions – The Mishnah with Yad Avraham commentary, the Schottenstein Edition Mishnah Elucidated, and the Ryzman Edition Hebrew Mishnah at – you guessed it – 20% off. The Stone Chumash, which has become accepted throughout the world as the standard English translation and commentary — priceless Torah wisdom, at a great price. There is an ArtScroll Siddur to suit every need – classic, interlinear, full and pocket size, women’s siddur, Hebrew only, hard and softcover… And, yes, all siddurim are now available at the same great sale price. It’s June, graduation time! June grads (and especially girls gearing up for post-high school sems) will love a gift of the Sapirstein Edition Rashi or Ramban – and you’ll love the sale price! More than just a book, Living Emunah has become a life-changing phenomenon for tens of thousands – and Living Emunah 2 is following in its footsteps. Both books, in all formats, are available at this great 20%-off price. You haven’t yet read Incredible, the book everyone is talking about? Now you can enjoy Nachman Seltzer’s bestselling biography of Rabbi Yossi Wallis at (you guessed it) 20% off. Susie Fishbein – the woman who started the “kosher revolution” – does it again, with KBD Brings It Home the final, delicious cookbook in the Kosher By Design series. And for all those summer weddings, stock up on ArtScroll’s other gorgeous cookbooks by Susie Fishbein, Leah Schapira and Victoria Dwek, and Danielle Silver and Norene Gilletz. Great gifts, great food, at a great price. Three cheers for summer! And twenty cheers for 20%-off sales! 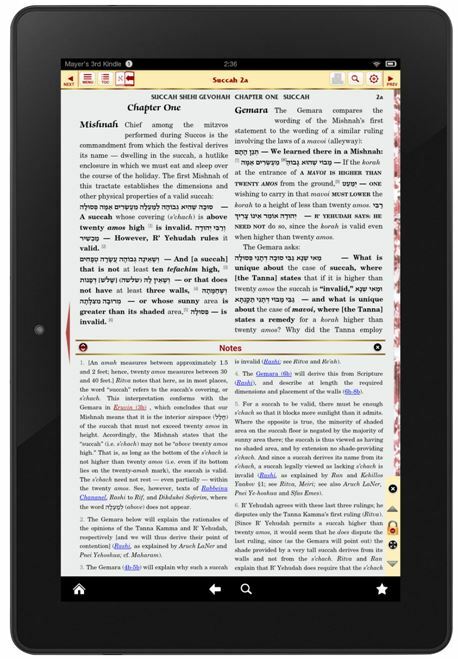 If you own a Kindle Fire – now you can enjoy the ArtScroll Digital Library on All Amazon Kindle fire readers. You can download the app for FREE from the Amazon App Store. Download the App for FREE and get a FREE sample of the current Daf Yomi Tractate – so You can try out the features of the app. You can view more information about the ArtScroll Digital Library here! Unfortunately, the Kindle e-ink devices will not support the Hebrew requirements and the complexity of the Talmud presentation.